• What size will fit me? • How will I know what fits my body type? • Every brand has different sizes; how do I know what each size means? • How will I know what to order when it is impossible to return? • Differences in size definitions among brands and countries makes it difficult to convert from one to another. • Most items cannot be tried on in stores. • These products do not lend themselves to alterations and must fit the customer perfectly. Despite the technological innovation that characterizes the online world, there is still no product in the market that enables virtual measurement of underwear and swimwear, since this type of purchase has unique issues relating to privacy. The existing solutions do not optimize the shopping experience. The customer's problems are the retailer’s problems. About 50% of products bought in the stores are returned, creating unhappy customers and a crippling financial loss for the brand. The returned products cannot be resold, due to hygienic reasons, and go directly to the outlets. The affected brands suffer from low purchase rates, the shopping cart is small, and the retailer does not have a large enough database of customer body shapes and sizes to work with. The Infimé 3D virtual fitting booth provides the ideal solution. Using innovative 3D image-converting technology, the company takes the guesswork out of shopping for clothes online. Infimé allows you to find clothes, online or in actual stores, that are a perfect fit for your body type. • Increasing their online sales by tens of precents. • Generating a quality shopping experience for the customer. • Solving privacy problems of lingerie shopping. • View an item on a three-dimensional virtual figure. • Learn what size fits them best no matter the site/shop. • Get suggestions for more items that women with a similar body type have liked. • The client is required to choose from among 5 body sizes – only once! • The 3D character is updated in real time and you can see a 360° view of the item on your personal figure. Link to an image of the product on the ASUS website. Tiniz site allows you to view the product under the new “TRY ME ON-LINE” option. The site displays virtual measuring for a selection of the site’s best sellers bathing suits. Another company application currently in development is an Automatic Self-Test: Through Machine Learning system. The system learns the customer's data and purchasing habits, as well as that of other customers. The system will enable the analysis of data important for the retailer on the body structure, measurements and purchasing habits of customers. Infimé is supported by any existing site, desktop, mobile (iOS and Android) and VR platform. 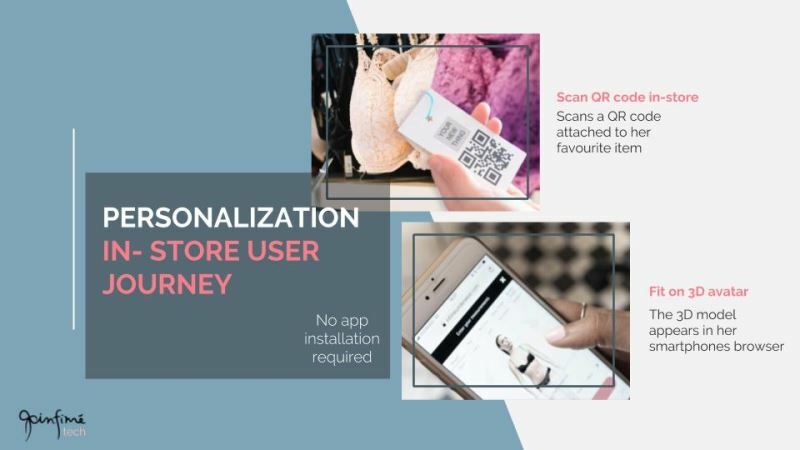 By scanning the QR code of the product in the store, the customer can try on the item by using the Smartphone (no download is required, the measurement opens directly in the browser) without going into the fitting room. Retailers receive real-time data on: the customer measurements, what she has tried on but did not buy, and what size to recommend for her. Retailers analyze the data from the store and produce valuable information. Link to an article in the Times of Israel. 1. Dramatic increase in percentage of sales. 2. Significant reduction in the percentage of returns. 3. The creation of valuable data on body types and measurements of customers online and from stores, valuable information that previously was not available to retailers. Infimé is targeting the world's leading online retailers. The company's business model is B2B; as such, the company has developed an easy-to-implement technology for each brand, to create a scalable company with automated tools. 1. Automatic modeling tools: Infimé technology (patent-pending) and unique algorithms allow you to quickly convert a complete catalog with thousands of products to a high-quality 3D catalog, using only the product image. 2. Integration: The integration required of retailers is convenient and fast to implement. Once they embed the one line of required code (zero integration), the virtual fitting room is posted on their site. 3. 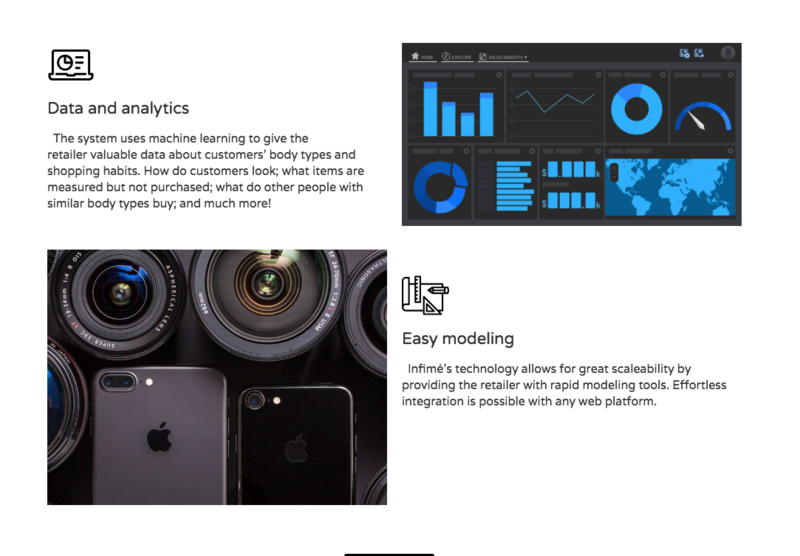 Data Analytics system: Infimé artificial intelligence system provides the retailer with qualitative information on customers’ measurements; body types; products tried on; products purchased; purchasing preferences of women with similar body sizes; analysis of data by geographic regions, and more. • The company has filed a patent in the global patent registry for algorithms that enable automatic modeling, and intends to submit additional patents during 2018. • The company received a grant from the Chief Scientist for technological and product development, following an in-depth examination of the technology, innovation, product and market need. 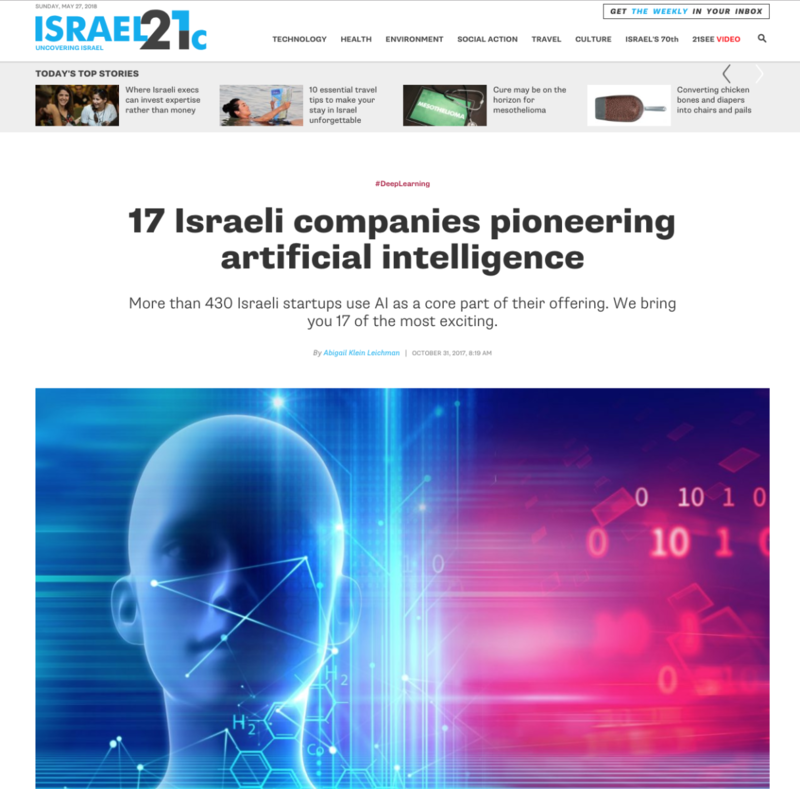 Inbar was recently chosen by Globes magazine as one of the 70 "brightest" young entrepreneurs, in celebration of the 70th anniversary of the State of Israel. Inbar was chosen by Lady Globes magazine as one of the 17 most promising start-up women for 2017. Mentors start-ups in the NOVUS program of the College of Management. “One of the brilliant young women of Israel” - Lady Globes Independence Day Project. Inbar is an experienced entrepreneur in the fields of eCommerce and fashion design (Fashion-Tech). In 2014, Inbar established Infim? 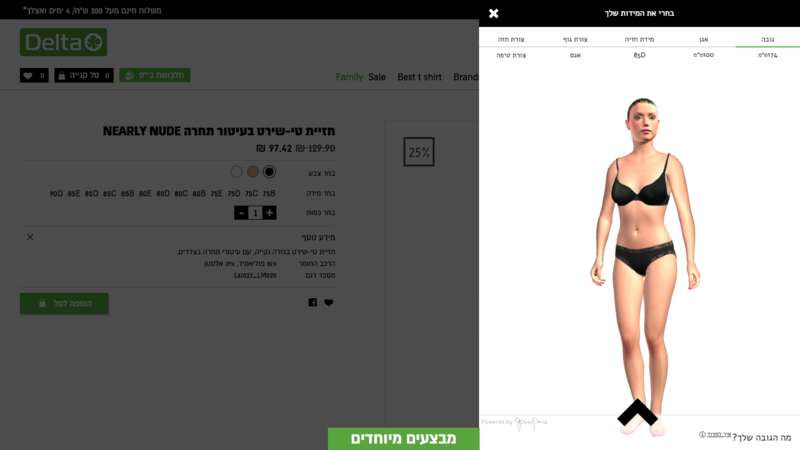 Underwear, an online lingerie brand, and created the largest fashion and technology community in Israel, with thousands of members, in order to create collaborations and conferences in the field of eCommerce, retail, fashion and start-ups. The community works with Google, eBay, WIX, and other companies. Inbar is a practicing lawyer and specializes in the civil-commercial field. Nir is a strategic advisor with extensive experience in international business development operations, combining financial and legal knowledge in order to lead start-up ventures to business success. He is a CPA and lawyer with an MA Finance from the College of Management‘s academic track. He is a serial entrepreneur, as well as a lecturer and consultant for projects at various stages of development. In his previous position, he was a senior consultant for the consulting firm EY. Nir is a CPA, holds an LLB, a BA in Business Administration and an MBA. A former manager of the Polgat clothing brand, Eitan currently manages Vendome—a fashion importer. He has 30 years’ experience in the fashion industry—manufacturing, retail and sales. He has extensive international connections with leading fashion companies around the world. Along with developing ties to international fashion companies, Eitan advises the company from the perspective of the Retailer, in order to adapt the product to the needs of the market and the customers. Shai Amir: Consultant CEO of James Richardson Fashion Company Supports the company and helps in establishing contacts and collaborations with the world‘s leading fashion companies such as: Victoria’s Secret, Calvin Klein, Tommy Hilfiger, and more. The financing rounds made through the ExitValley platform are in accordance with a model of statutory exemption from publishing a prospectus pursuant to sections 15A(A)(1) and 15A(A)(7) to the Israeli companies law - 1965.